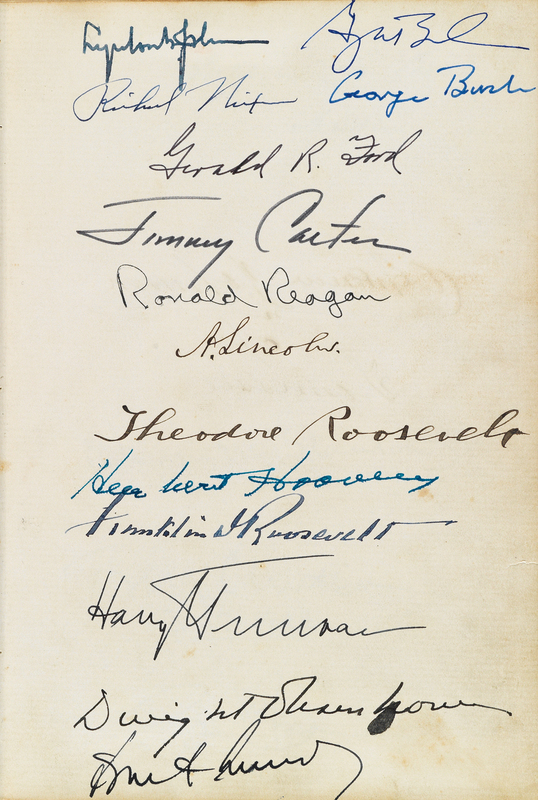 Personal correspondence and manuscript material are always a highlight in our auctions of Printed & Manuscript Americana. On April 12, we’ll be offering a selection letters from Thomas Belknap, a clerk from Newburgh, New York, who enlisted in in the Union Army in February 1862 and was shipped out the next month aboard the steamer USS Octorara to blockade Confederate ports in Virginia. 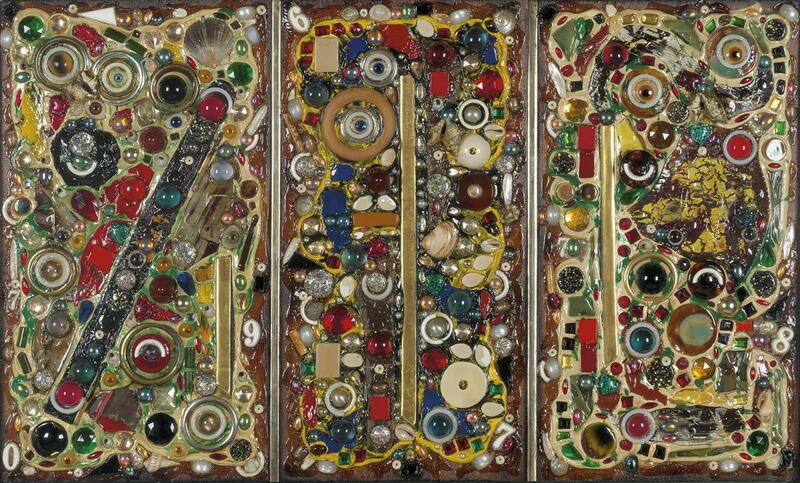 His messages reveal the trials of daily life as a young soldier in the Civil War. 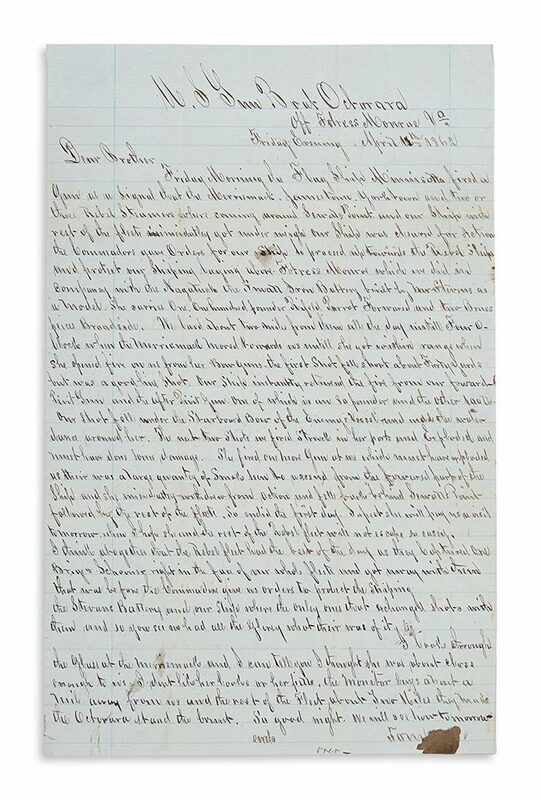 Lot 70: Thomas Belknap, Autograph Letter Signed, describing a battle with the Merrimack, off Fortress Monroe, Virginia, April 1862. Estimate $2,000 to $3,000. 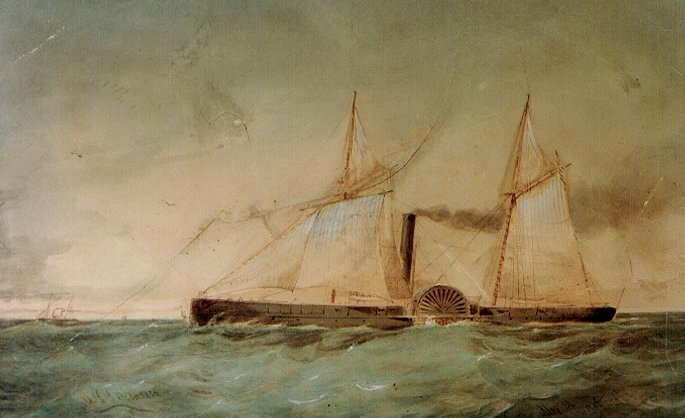 The earliest letter offered, which dates to 1862 and was written off the coast of Virginia, describes a rare close encounter with the Confederacy’s most widely feared vessel, the ironclad Virginia, better known as the Merrimack. Written just a month after the Battle of Hampton Roads, it also gives a mention to the USS Monitor, the nemesis of the Merrimack. Alex Stuart, Octorara, watercolor, 1861. Courtesy of AmericanCivilWar.com. Belknap had to wait another two days to post the letter, during which time he added: “They went to get our ship under weigh this morning and found her hard aground. . . . They have discovered by the glass that the Merrimack is in the same fix as ourselves.” The CSS Virginia would be scuttled just a month later, making this a rare first-hand account of direct engagement with the ironclad. Belknap’s map of Mobile, Alabama. 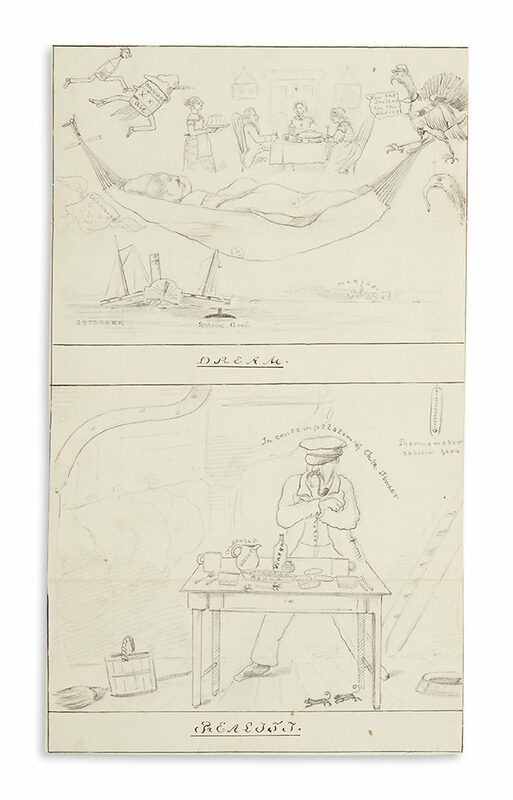 Lot 71: Thomas Belknap, group of letters and drawings done aboard the USS Octorara in Mobile Bay, Alabama, 1864-65. 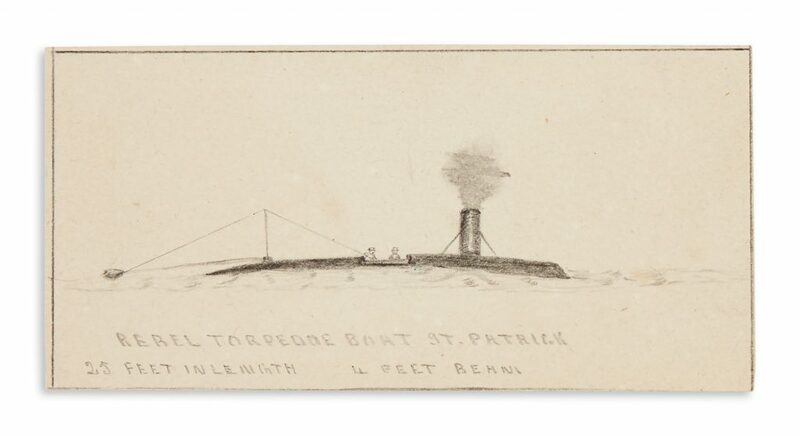 Letter from Thomas Belknap describing a Confederate torpedo boat. 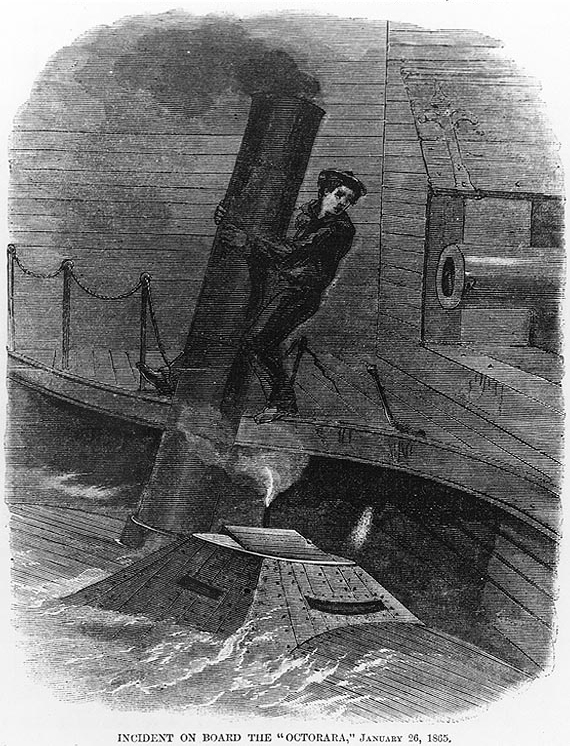 The 1-3 February 1865 letter describes the Octorara‘s encounter with a torpedo boat: “One of the lookouts stationed aft discovered some dark object on the surface of the water which through the darkness resembled one of the many dugouts or canoes which the refugees are in the habit of coming off to our ship nightly in. . . . In a moment the boat struck us right about the after gangway, but by some stroke of good fortune the torpedo failed to explode. . . . One of our sailors boldly jumped down on the gangway ladder and seized the torpedo boat with both hands by the smoke stack braces and partly careened her over.” The boat made its escape without causing any damage. “We presume it is the one that the Johnnies call the St. Patrick. She is twenty-five feet in length, four feet beam, partly segar shape, made by iron, bullet-proof & generally carries three men.” In addition to Belknap’s own sketch of the St. Patrick and vivid description, an engraving of the event was published in Harper’s Bazaar. Incident on board the Octorara, January 26, 1865, engraving for Harper’s Bazaar. Courtesy of ibiblio.org. The final letter in the collection is dated 28 May 1865, after the fighting had ended. Belknap describes a massive explosion in an arsenal which had flattened much of Mobile’s harbor three days previously: “Our ship was laying within 300 yards of the building in the stream directly opposite to it. The force of the concussion knocking down the largest part of those on land, at the same time the air was filled with exploding shells. At one time I should judge there where at least five hundred shells exploading over and around our ship. . . . From a half to a mile from the explosion there is hardly a building but what has suffered damage. . . . Thousands of men worked hour after hour among the debris, and brought forth one after another of the writhing and dead victims, some had legs blown off, some an arm, some with heads cracked and some in such a condition as to present anything but the semblance of human beings.” Some 300 people were killed in the explosion; the massive depression remained in the ground for years afterwards, and much of the northern part of the city was destroyed. The cause was never determined. 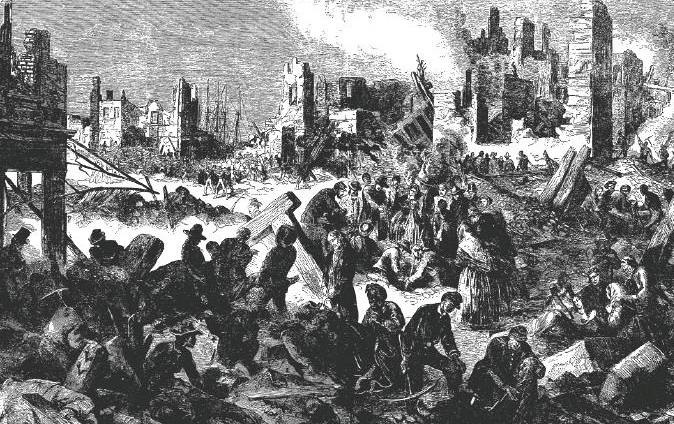 Engraving of the aftermath of the explosion in Mobile, Alabama, in which an estimate 300 people died. Courtesy of Alabama Pioneers. This lot also includes two of Belknap’s sketches of Mobile Bay, and a photograph of a third. 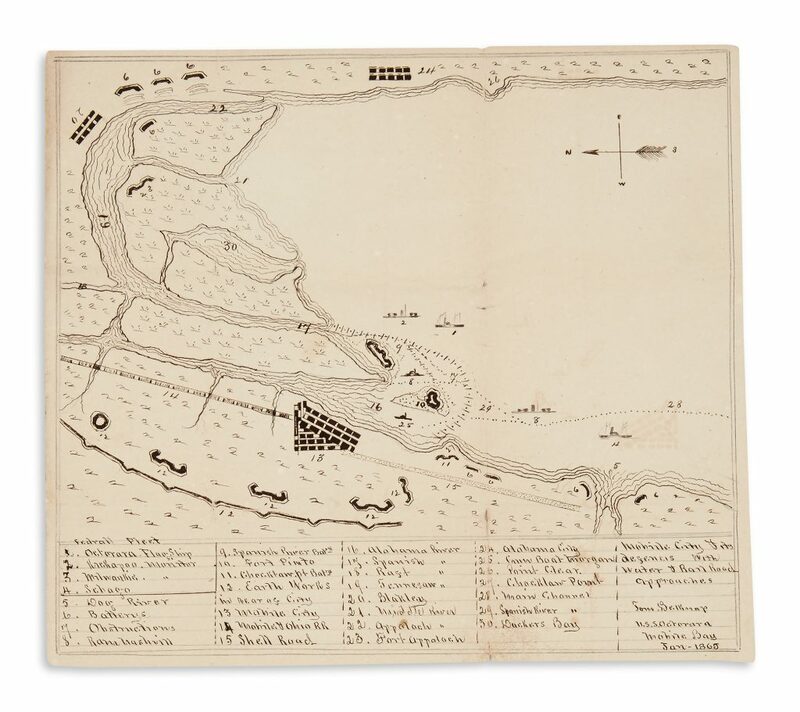 One dated January 1865 is titled Mobile Bay & its Defences, with Water and Railroad Approaches, and includes a key with 30 points described, including the location of each ship in the Union fleet. As a whole, an eventful and visually appealing record of the Union blockade of Mobile.